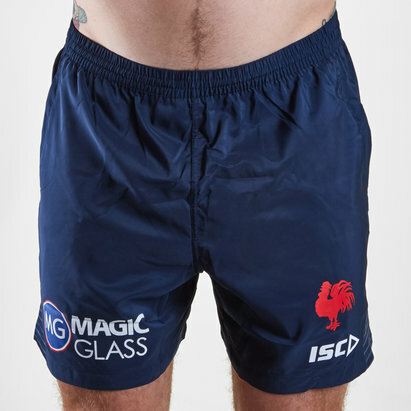 Cheer on the Easts in the 2019 NRL with the Sydney Roosters NRL Youth Supporters Rugby Shorts from ISC. The Sydney Roosters play their rugby in Austalia's premier rugby league competition, the National Rugby League NRL. The club is one of the oldest and most successful clubs in Australian rugby league history, having won fourteen New South Wales Rugby League (NSWRL) and National Rugby League titles, and several other competitions. Only the South Sydney Rabbitohs and the St George Dragons have won more premierships. The club holds the record for having the most wins and the second greatest margin of victory in a match in Australian rugby league history and has won more minor premierships than any other club. The Roosters is one of only two clubs (the other being the St. George Illawarra Dragons in 1999) to finish runners-up in its inaugural season. the team won the 2018 NRL and look to finish 2019 in the same fashion. Red, white and blue have been the colours of every jersey design in the club's history; however, the jersey design has undergone several alterations. The jersey worn in the first premiership season consisted of several hoops; red stripes dominated over consecutive smaller white and blue stripes. Although the width and the order of these stripes have changed, the basic design has always been maintained. Sticking to tradition these shorts are white with red and navy blue detailing down the sides. The NRL logo is on the left whilst the club badge is on the right. Please note, we are unable to ship this product to Australia.